Grandes lignes: Story of Zacchaeus with application. Dramatized. (Drums or expression of proclamation) (Shouting) He is coming! The great one is passing through our village!" And in the city of Jericho everybody was preparing to see Jesus, when He passed through. The street was full of people. Suddenly there was a shout of welcome! (Pause 3 sec. for shout of welcome or luluing) Jesus had already entered into Jericho. All of the people wanted to see Him, - even the elders and the big men. And there was a certain rich man named Zacchaeus, who had tried to see Jesus, but he could not in the big crowd of people, because he was a very little man. But then, just in time, Zacchaeus remembered a certain tree at the end of the street, and he hurried and climbed into it. Now he would be sure to see this Great One Who would pass. (Pause 3 sec. for crowds nearing). "Here they come!" said Zacchaeus, "and I will see Jesus, yet He will not see me." Zacchaeus knew that he had much to hide from the eyes of Jesus the Son of God. For this little man's heart was full of loving money. Because of this he had become dishonest and had cheated and robbed the people many times. Everybody in Jericho knew that Zaccheous was a sinner. Now Zacchaeus watched as the crowd came very close. (Pause 3 sec. for crowds, close) Yes, there was Jesus, right in the midst of them! And He was coming straight toward the tree! "Oh!" thought Zacchaeus, "Does Jesus know I am here? He is coming right to the foot of this tree!" The same instant, Zacchaeus found that he was looking right down into the eyes of Jesus. And Jesus was speaking to him. "Zaccheus, quick, come down, for today I must stay at your house!" Instantly Zaccheus dropped down from the tree, and joyfully took Jesus to his house. Outside the people grumbled. They said, "How can Jesus Christ be a guest of this sinner? (Pause 3 sec. for crowds murmuring.) But in the house where Jesus sat, salvation had come to Zaccheus. He had opened not only his house, but his heart to the Saviour. Already a great change had taken place in his heart, for Zacchaeus was saying to Jesus, "Lord, to each person whom I have robbed, I want to repay with four times as much. And half of all I have, I will give to the poor." And Jesus answered him, "Zacchaeus, today salvation has come to your house." 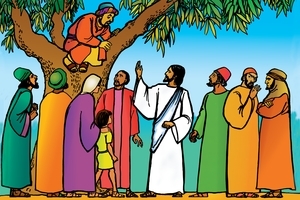 Why could Jesus answer Zacchaeus in this way? Because by his actions, Zacchaeus was showing that his heart was new. You can tell a fruit tree by its fruit. You can tell a Christian by his actions. A true Christian will always make right the wrongs that he has done against others. A true Christian is a new person in his heart. GRN has recorded a version of this script in 64 languages and dialects. See full list.